Cool, comfortable, and beautiful cotton for all your summer sewing! These lightweight cotton prints make wonderful blouses, dresses, skirts, kids' clothes, even delicate pajamas! This superb designer floral print is from Gucci. This handkerchief print can be used for garments; skirts and dresses especially look lovely with a handkerchief motif. Or you can cut the panels out and make simple, hemmed scarves. Florals are always in season. There is always more to see when you stop by our store! More photos of our new favorite prom dress! If you liked the fabulous lace prom dress we shared last week, take a look at these photos from the event! The dress is modeled by Amanda, the young woman who designed and sewed it! Check out our previous post for more details about this dress! If you loved the chambray gauze we shared last week, take a look at this cute dress that Treadlette Julia made! The soft pleats at the neckline take advantage of the fineness and drape of the double gauze. Don't try this with a too-crisp or bulky fabric; you need one that gently flows. Julia used New Look 6431, a sweet, summery, sleeveless pattern. Nice choice, Julia! We have some bright new activewear fabrics in the store. These high-stretch knits are all about performance. Sew the perfect garments for running, yoga, or the gym! Many of our new activewear fabrics are a micro-perforated dot mesh, which can help moisture to quickly evaporate off the skin. Don't settle for poorly fitting workout clothes. Sew your own custom versions and get your body moving in comfort! You may have seen this dress displayed in our front window. It was made by one of our Treadle sewing class students for her senior prom. We were absolutely blown away by the fantastic job Amanda did on this ambitious design! Amanda used a heavily beaded and embroidered lace which she appliqued by hand to the foundation fabric. The back has a great detail, too: A deep V laced closed with a huge pink silk bow! Amanda used Vogue 8729, a vintage re-release, to make this dress. And finally, to finish the outfit, a little clutch purse made in matching silk with a leftover scrap of the beaded lace. Adorable! Thanks for sharing your fabulous dress with us, Amanda! We have some new Tana Lawn fabrics from Liberty of London, just the thing for the hot summer weather! Double gauze fabrics are always popular, and we can see why" they're soft, light, and so comfortable to wear. We have some new cotton double gauze fabrics in chambray shades, with a subtle woven dot pattern. Ideal for cool shirts and blouses! Lace isn't just for bridal wear! We have a huge assortment of new laces in bright summery colors! Lace looks sheer and cool blended with solid fabrics and can go from dressy to casual depending on how you style it. The latest issue of Vogue Patterns Magazine has a feature on using lace for casual summer garments. It's full of great ideas! There are also loads of laces in black and subtle neutrals. We have some gorgeous new shot cottons in the store, glowingly bright with intense color! A "shot" weave combines two colors, one in the warp and another in the weft, to create a blended, iridescent effect. These shot cottons are soft and lightweight, just the thing for summer garments. Stop by and see these great colors and more in our store! Grand Old Days Summer Meander is Saturday June 4! Shop & sew at Treadle Yard Goods to benefit Sew Good Goods, a local non-profit dedicated to donating high quality hand-crafted items. Purchase a pre-cut pillow case kit for $12.50, or 2 for $23.00, and Treadle will donate $7.00 from each kit sold to Sew Good Goods. 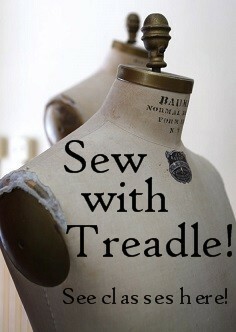 Sew it up right away if you like! No experience necessary. Sewing available in our classroom from 10:00 - 1:00. Sewing machines and expert help provided. Pillow case kits available all day 10:00 - 5:00. Plus 20% off all 45” cottons Friday June 3 & Saturday June 4! We will be open our regular hours, Friday 10:00 - 6:00, Saturday 10:00 - 5:00, but closed Sunday for the Grand Old Days big event.